Dr. Alain RAMBACH, Dr. Marco AGOSTI and Pr. Franco OTTAVIANI, recently met up by the peaceful Lago di Garda in Italy. These three renowned scientists have largely contributed to improved microbial quality control in food/beverages by introducing the powerful chromogenic technology for the most common foodborne pathogens detection. Dr. RAMBACH designed the Rambach agar (1989 !) for Salmonella detection, and Dr. AGOSTI and Pr. OTTAVIANI designed the ALOA formulation for Listeria monocytogenes. During the meeting, the three microbiologists not only to reviewed the history and evolution of microbial testing, but also explored new developments. From these discussions was born the idea of a collaboration, which eventually led to the launch of CHROMagar™ Enterobacteria, a chromogenic medium for the simultaneous enumeration of Enterobacteriaceae (appear as red colonies) and E.coli (appear as blue colonies). Once again revolutionizing microbiological analysis in the field of food testing, this medium is a reliable way to drastically reduce the workload of the laboratory compared to the very labour intense traditional VRBG which is the standard method, which by the way, does not differentiate E.coli from the other Enterobacteriaceae. 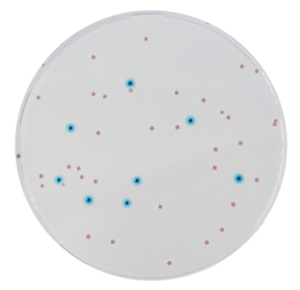 CHROMagar™ Enterobacteria is a two-in-one medium, allowing for the detection and differentiation by color of E. coli and other Enterobacteriaceae. For more information on this product please click here .